On this Day of Prayer, I wish first to thank the Lord for the gift of our common home and for all those men and women of good will committed to protecting it. I am likewise grateful for the many projects aimed at promoting the study and the safeguarding of ecosystems, for the efforts being made to develop more sustainable agriculture and more responsible nutrition, and for the various educational, spiritual and liturgical initiatives that involve Christians throughout the world in the care of creation. It must be acknowledged that we have not succeeded in responsibly protecting creation. The environmental situation, both on the global level and in many specific places, cannot be considered satisfactory. Rightly, there is a growing sense of the need for a renewed and sound relationship between humanity and creation, and the conviction that only an authentic and integral vision of humanity will permit us to take better care of our planet for the benefit of present and future generations. 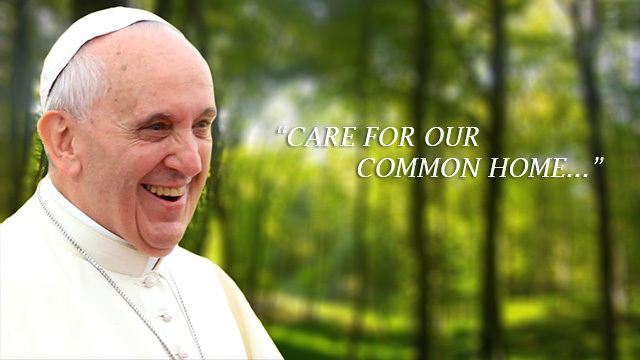 For “there is no ecology without an adequate anthropology” (Laudato Si’, 118). On this World Day of Prayer for the Care of Creation, which the Catholic Church for several years now has celebrated in union with our Orthodox brothers and sisters and with participation of other Churches and Christian communities, I would like to draw attention to the question of water. It is a very simple and precious element, yet access to it is, sadly, for many people difficult if not impossible. Nonetheless, “access to safe drinkable water is a basic and universal human right, since it is essential to human survival and, as such, is a condition for the exercise of other human rights. Our world owes a great social debt towards the poor who lack access to drinking water, because they are denied the right to a life consistent with their inalienable dignity” (ibid., 30). Water invites us to reflect on our origins. The human body is mostly composed of water, and many civilizations throughout history arose near great rivers that marked their identity. In an evocative image, the beginning of the book of Genesis states that, in the beginning, the spirit of the Creator “swept over the face of the waters (1:2)”. In considering the fundamental role of water in creation and in human development, I feel the need to give thanks to God for “Sister Water”, simple and useful for life like nothing else on our planet. Precisely for this reason, care for water sources and water basins is an urgent imperative. Today, more than ever, we need to look beyond immediate concerns (cf. Laudato Si’, 36) and beyond a purely utilitarian view of reality, “in which efficiency and productivity are entirely geared to our individual benefit” (ibid., 159). We urgently need shared projects and concrete gestures that recognize that every privatization of the natural good of water, at the expense of the human right to have access to this good, is unacceptable. For us Christians, water represents an essential element of purification and of life. We think immediately of baptism, the sacrament of our rebirth. Water made holy by the Spirit is the matter by which God has given us life and renewed us; it is the blessed source of undying life. For Christians of different confessions, baptism also represents the real and irreplaceable point of departure for experiencing an ever more authentic fraternity on the way to full unity. Jesus, in the course of his mission, promised a water capable of quenching human thirst for ever (cf. Jn 4:14). He prophesied, “If any one thirst, let him come to me and drink (Jn 7:37). To drink from Jesus means to encounter him personally as the Lord, drawing from his words the meaning of life. May the words he spoke from the cross – “I thirst” (Jn 19:28) – echo constantly in our hearts. The Lord continues to ask that his thirst be quenched; he thirsts for love. He asks us to give him to drink in all those who thirst in our own day, and to say to them, “I was thirsty and you gave me to drink” (Mt 25:35). To give to drink, in the global village, does not only entail personal gestures of charity, but also concrete choices and a constant commitment to ensure to all the primary good of water. I would like also to mention the issue of the seas and oceans. It is our duty to thank the Creator for the impressive and marvellous gift of the great waters and all that they contain (cf. Gen 1:20-21; Ps 146:6), and to praise him for covering the earth with the oceans (cf. Ps 104:6). To ponder the immense open seas and their incessant movement can also represent an opportunity to turn our thoughts to God, who constantly accompanies his creation, guiding its course and sustaining its existence (cf. St. John Paul II, Catechesis of 7 May 1986). Constant care for this inestimable treasure represents today an ineluctable duty and a genuine challenge. There is need for an effective cooperation between men and women of good will in assisting the ongoing work of the Creator. Sadly, all too many efforts fail due to the lack of effective regulation and means of control, particularly with regard to the protection of marine areas beyond national confines (cf. Laudato Si’, 174). We cannot allow our seas and oceans to be littered by endless fields of floating plastic. Here too, our active commitment is needed to confront this emergency. We need to pray as if everything depended on God’s providence, and work as if everything depended on us. Let us pray that waters may not be a sign of separation between peoples, but of encounter for the human community. Let us pray that those who risk their lives at sea in search of a better future may be kept safe. Let us ask the Lord and all those engaged in the noble service of politics that the more sensitive questions of our day, such as those linked to movements of migration, climate change and the right of everyone to enjoy primary goods, may be faced with generous and farsighted responsibility and in a spirit of cooperation, especially among those countries most able to help. Let us pray too, for all those who devote themselves to the apostolate of the sea, for those who help reflect on the issues involving maritime ecosystems, for those who contribute to the development and application of international regulations on the seas in order to safeguard individuals, countries, goods, natural resources – I think, for example, of marine fauna and flora, and coral reefs (cf. ibid., 41) or sea beds – and to guarantee an integral development in view of the common good of the entire human family and not particular interests. Let us remember, too, all those who work to protect maritime areas and to safeguard the oceans and their biodiversity, that they may carry out this task with responsibility and integrity. Finally, let us be concerned for the younger generation and pray for them, that they may grow in knowledge and respect for our common home and in the desire to care for the essential good of water, for the benefit of all. It is my prayerful hope that Christian communities may contribute more and more concretely helping everyone to enjoy this indispensable resource, in respectful care for the gifts received from the Creator, and in particular rivers, seas and oceans.